Itineraries for Robert's long distance bicycle tours in USA, Canada. These aren't necessarily the best routes, just the ones I used. In most cases they were adequate. Very good in some cases. I have done some other trips not described here, but pictures are in the photos by region. Road names in this itinerary list remain on this page since they draw Google searches. I started this list before Google Maps. For better depiction, follow links for each trip to the newer Google maps I made. This list remains as a legacy. Back road through Nemo, SD. Ferry across to Luddington, MI. See more trips below maps. See photos by year in my Flickr Tags. Narrow bridge to White Salmon, WA. 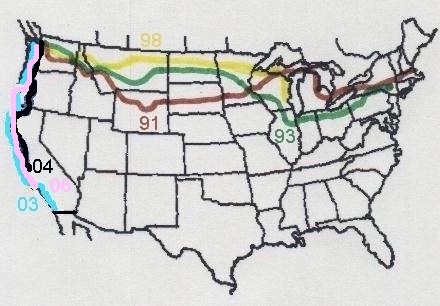 Same route as in 2000 to Sisters, OR. Turn north at Mt. Vernon, OR. I was more inland, for a ways. like in San Francisco Bay Area. Forest Service Roads to Asotin, WA. 2006 Bellingham to Santa Barbara, CA. I haven't done maps for trips since 2011. 2015, Down coast again. Portland, Oregon to Salinas, CA. 2016, Olympic Peninsula, Victoria and Vancouver, BC. 2017, Across Washington State again. 2018, Olympic Peninsula, Victoria and Orcas Island.